Home > Salted Capers. 1kg. The salted and pickled caper bud (called simply a caper) is often used as a seasoning or garnish. Capers are a common ingredient in Mediterranean cuisine, especially Italian. The mature fruit of the caper shrub are prepared similarly and marketed as caper berries. The buds, when ready to pick, are a dark olive green and about the size of a fresh kernel of corn. They are picked, then pickled in salt, or a salt and vinegar solution, and drained. Intense flavor is developed as mustard oil (glucocapparin) is released from each caper bud. This enzymatic reaction leads to the formation of rutin, often seen as crystallized white spots on the surfaces of individual caper buds. 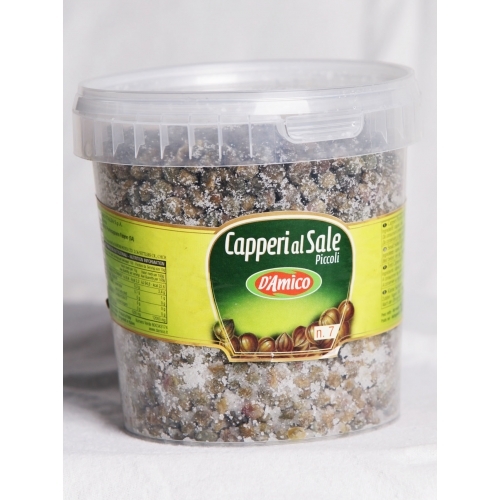 Capers are a distinctive ingredient in Italian cuisine, especially in Sicilian and southern Italian cooking. They are commonly used in salads, pasta salads, meat dishes, and pasta sauces. Capers are known for being one of the ingredients of tartar sauce. They are often served with cold smoked salmon or cured salmon dishes (especially lox and cream cheese). Capers and caper berries are sometimes substituted for olives to garnish a martini. Capers are categorized and sold by their size, defined as follows, with the smallest sizes being the most desirable: non-pareil (up to 7 mm), surfines (7-8 mm), capucines (8-9 mm), capotes (9-11 mm), fines (11-13 mm), and grusas (14+ mm). If the caper bud is not picked, it flowers and produces a caper berry.